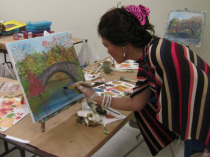 Taking an art class lets the artist in you emerge and create an original oil painting in less than four hours. It is a fantastic way to have fun and relax! You learn to oil paint using the wet-on-wet technique. You will take home your original, beautiful painting to enjoy and share with your family or give as a gift. Class is casual and fun. Paint landscapes, seascapes, flowers or more. Easy step-by-step instruction. Let Janet show you the stroke and you interpret the step. Janet's motto: "My way, your way!" Must PRE-REGISTER! Please contact Janet to register for classes as she does not come to the store if no one is signed up. If you need a specific day, time, or painting, contact Janet directly; she is flexible. These classes are for the student who is interested in learning to paint on their own possibly without instruction. You will learn the wet-on-wet technique. LENGTH: 6 courses. You will learn the different stages in a painting and practice the various techniques and strokes. In the final class, you bring in a photo to paint and create your custom art piece using the information discussed and practiced throughout the workshop. You may pay all 6 classes in advance at $40 per class or hold your spot at $45 per class. CLASS SIZE: limited to a maximum of 9 and minimum of 3 students. Technique workshops will be offered in landscape, seascapes, or flowers. Must PRE-REGISTER! If you are interested contact Janet and she will get you setup! Need a fundraiser for your organization or just want to get together with friends? Schedule a private painting party! Classes may be setup anywhere: your home, place of business, recreation center, Church, meeting room, wine shop, framing business or anywhere with room for a few tables. Need a gift for a special occasion? Give a gift certificate or a painting.